Russell is playing out of his mind, and the Nets are the hottest team in the NBA. 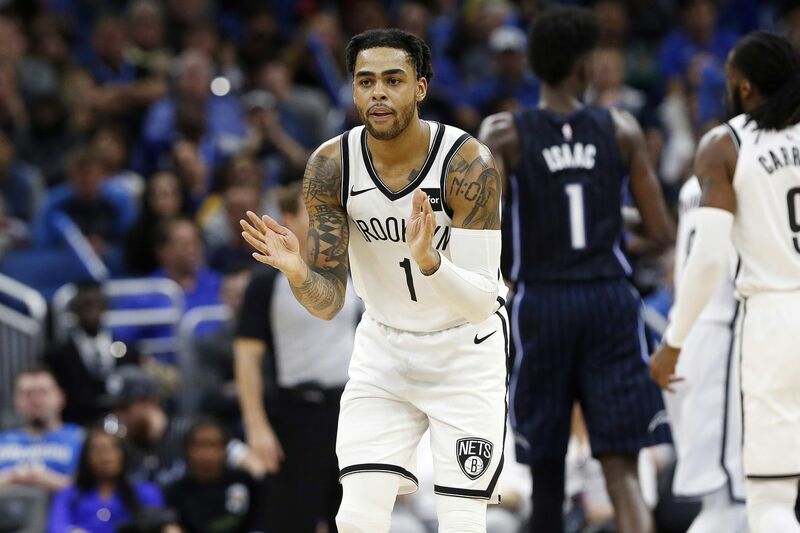 D’Angelo Russell scored 19 straight points in the second quarter of Brooklyn’s come-from-behind victory over Orlando on Friday. It was the most consecutive points scored by any player this season, and it helped the Nets rally from down 19 to secure a 117-115 win. Brooklyn is the hottest team in the NBA, having won 16 of their last 21 games since going 8-18 to start the season. The Nets are in the playoff hunt for the first time in years, with the sixth-best record in the Eastern Conference. They’re above .500 without Caris LeVert, who is set to return from his foot injury in the second half of this season, and without first-round pick Dzanan Musa, who has had nagging injuries that have kept him off the court. Brooklyn’s success has been a team effort, but Russell is leading it while emerging as an All-Star candidate during the team’s hot streak. Russell is averaging career-highs in points (19), assists (6.4), three-point percentage (37.4), field goal percentage (43.7) and free throw percentage (81). He’s upped those numbers to 20 points and 7.1 assists per game during Brooklyn’s 21-game stretch. Reporter: Is D’Angelo Russell an All-Star? Kenny Atkinson: D’Angelo, what can I say? This last month and a half he’s been out of his mind. He’s just playing great basketball. Russell has averaged 19.9 points on 44% from the field, 36% from 3 and 7.1 assists his last 25 games. Russell a far cry from the player NBA legend and Lakers president Magic Johnson said wasn’t a leader before trading him to Brooklyn and drafting Lonzo Ball as the Lakers’ point guard of the future. Russell is proving he is a leader on this Nets team that watched its best player suffer a gruesome injury early in the season. He’s playing like those who watched him play college ball at Ohio State knew he could all along. Russell’s 19-point second-quarter burst against the Magic was only a fraction of the 40-point game he had on the night. Brooklyn’s point guard shot 64 percent from the field and made eight of his 12 three-point attempts. He also hit the dagger, go-ahead step-back three over Evan Fournier to give Brooklyn a 117-113 lead with less than 30 seconds left in the fourth quarter. Russell’s 40-point game tied his career-high, but it wasn’t the only time he’s lit the floor up. He’s averaging 23 points and 7.4 assists on 50-40-90 club numbers (50 percent from the field, 43.8 percent from three, 93 percent from the foul line) in the month of January. It’s a consistency the Nets have welcomed as their best prospect morphs into the best version of himself. LeBron James on the floor. It also doubled as one of the biggest games of Russell’s season. He downplayed it, but it was palpable that against the team that traded him meant the world. He scored 22 points and set a new career-high with 13 assists on the night. Russell also scored 34 points and hit seven threes in Brooklyn’s win over the Kyrie Irving-less Boston Celtics. He also scored 32 points on 13-of-19 shooting in just 29 minutes in a win over the Hawks. D’Angelo Russell put up 32 PTS (13-19 FG), 7 AST, 6 REB in 29 MINS during the Nets 144-127 win vs the Hawks. And you can’t forget his 29 points in Brooklyn’s overtime win over Kawhi Leonard’s Toronto Raptors. The NBA All-Star Game is a popularity contest, and Russell’s name did not even show on the NBA’s third All-Star voting returns. If you combine team record with individual stats, though, he is having a better season than at least three Eastern Conference guards who were in the top-10 of guards who received votes. The 3rd returns for #NBAAllStar game voting are here!! The good news, though, is that only the All-Star starters are chosen by the fans — and their votes are only weighed as 50 percent of the vote. The reserves are selected by head coaches. Brooklyn might not be the most popular team, but they have earned the respect of their peers with their year-to-year improvement. Russell has emerged as an All-Star in Brooklyn, and Spencer Dinwiddie has become a stud off the bench, too. Two stars are emerging on this Nets roster, and their best player is coming back from injury in the coming months.